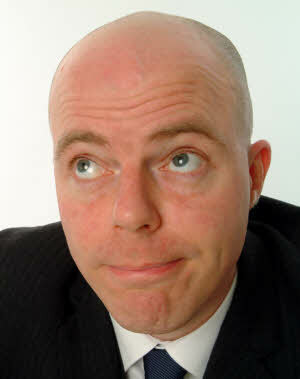 Roger Monkhouse is one of the most original and distinctive acts on the comedy scene. A consummate stand-up who employs a deadly combination of charm and menace to exert a masterful control over any audience. A highly original and quirky performer, Roger's trademark stage-prowling style and curious, inimitable manner have established him as one of the hottest names on the comedy circuit. Distinguished as a comic by his eloquence and keen eye for a fine phrase, Roger's easy observational style is spiked by the signal flares of an accomplished gag writer. A supremely confident compere and seasoned corporate host, Roger is happy to improvise freely with a crowd and is at great ease bantering with an audience, but has no shortage of first class observational material in his armoury. As one of the most sought after acts on the comedy circuit, Roger headlines at all the major comedy venues and has performed extensively throughout the United Kingdom and Internationally, most recently performing in Belgium, The Netherlands, South Africa, China, Singapore, Tokyo and the Middle East. He has also featured on major national tours of the UK sponsored by Hooch and J2O. Recent television credits include 'The Comedy Store' and ‘The World Stands Up’, (both Paramount), ‘My God I’m My Dad’ (Bravo) and ‘Street Cred Sudoku’ (UKG2). He is one of the regular writers on Channel 4’s hugely popular comedy panel show ‘8 Out of 10 Cats’ - responsible for scripting up-to-theminute topical gags every week for the show which features Jimmy Carr alongside team captains Dave Spikey and Sean Lock. On the airwaves, he was recently a guest panellist on comedy panel show ‘Jest A Minute’ (BBC Radio Wales) as well as contributing to review show ‘Serious About Comedy’ (BBC7). A fine topical writer and performer, and master of sharp observational comedy, Roger is a regular member of the prestigious and critically acclaimed 'Cutting Edge' team at the London Comedy Store. He also performed with the Manchester based topical and satirical team 'MEN at Work' at the Manchester Comedy Store. His forte is delivering intelligent, thought provoking material that pulls no punches and is always incisive, relevant and up to date. Articulate, quick witted and spontaneous, if something's in the news, Roger has a routine about it. Roger's distinctive voice and sharp enunciation make him particularly suited to voice over work. Raised in Kingston upon Thames, he retains his Estuary drawl and remains untainted by a South Yorkshire accent despite a decade of living in Sheffield. Roger is a prolific writer and is currently working on several original ideas for TV and Radio.